Cargill's new feed mill being built in Hedrick, Iowa, will be similar to the mill pictured above, also built by Younglove Construction. HEDRICK, Iowa – September 4, 2013 – Cargill’s pork business broke ground this week for construction of a new, $29-million, state-of-the-art, feed mill in Hedrick, Iowa. 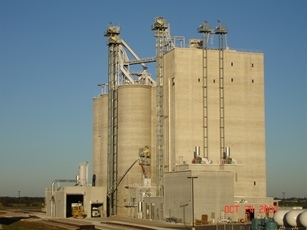 The new feed mill, capable of producing 350,000 tons of pelletized hog feed annually, is strategically located in proximity to feedstock raw material supplies; hog finishing operations in southeast Iowa and northern Missouri; as well as to the company’s pork processing plants at Ottumwa, Iowa, and Beardstown, Ill. The feed mill also will be located near key transportation corridors serving the region. Sioux City, Iowa, firm Younglove Construction, L.L.C., will build the feed mill, which is scheduled to be completed in late 2014. In 2011, Cargill purchased a 21,500-acre site near Dalhart, Texas, for $33 million, to increase its pork production capabilities. That facility, which will reach full production capacity in late 2015, is continuously increasing the number of hogs being sent to farms in the region that will benefit from the new Iowa feed mill. Cargill became a major entity in the U.S. pork business in 1987, with the acquisition of pork processing plants in Ottumwa and Beardstown, and it is now one of the largest U.S. pork processors.